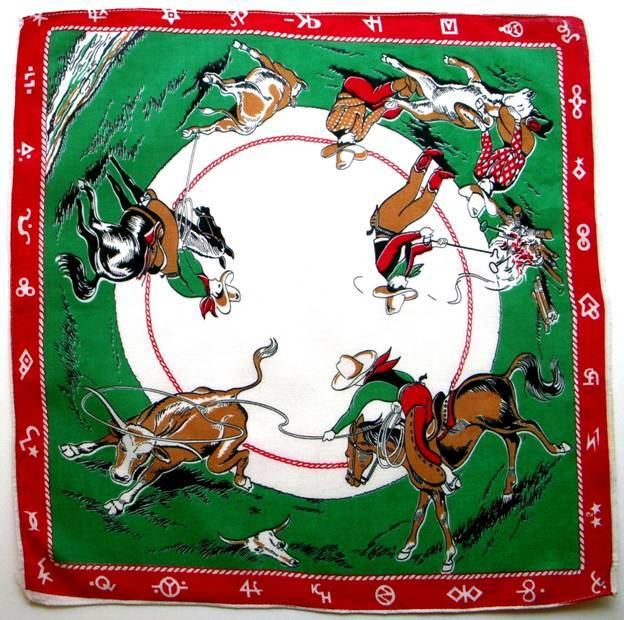 Summertime spells Rodeo and this week we celebrate the National Day of the American Cowboy on July 27th. So all you bronc riders and buckaroos saddle up and swing by the O.K. Corral for some hankie viewin’. 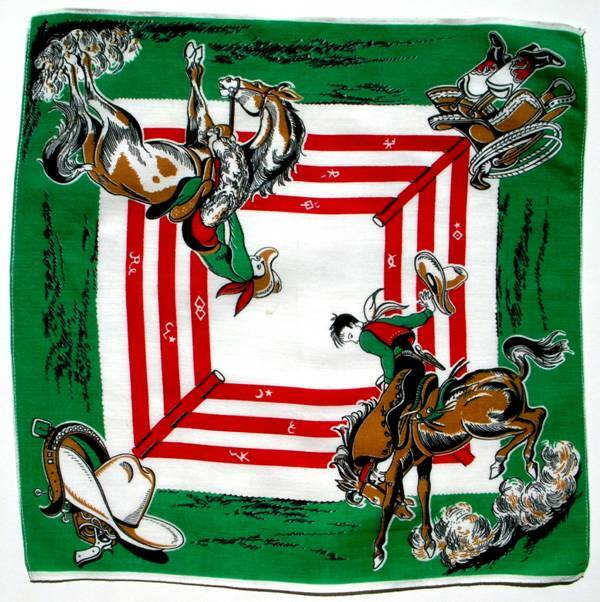 The crisp red and green sets off our buckin ’broncs with graphics that giddy up. 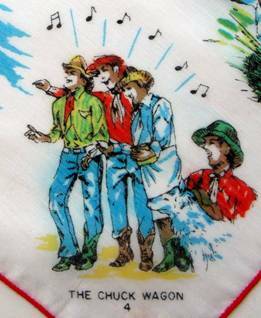 The border on the hankie above leaves little doubt as to what’s going on here. Yeeeooouuch! 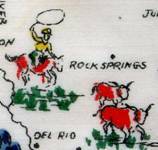 Those little doggies are getting a ‘cowboy tattoo.’ At least we’ll know what ranch they call home if they ever wander too far away. 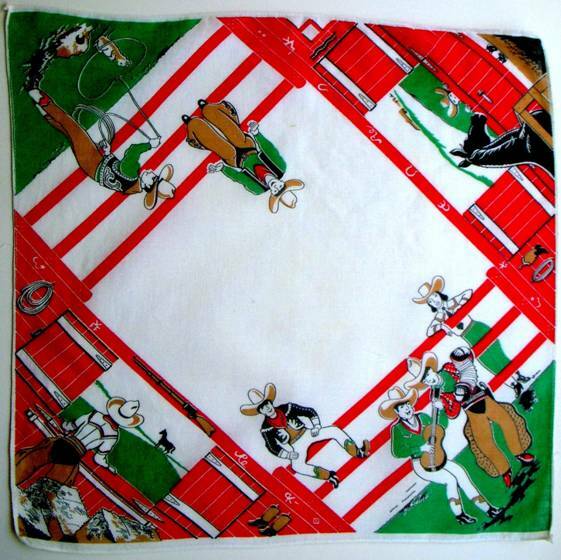 This hankie is less ropin’ and more lopin’ at the corral after a long day in the saddle. A nosey prairie dog quickly discovers where not to appear if he plans to see the sun rise tomorrow. This musical duo welcome sunset with a serenade on the concertina, attracting the gals nearby. 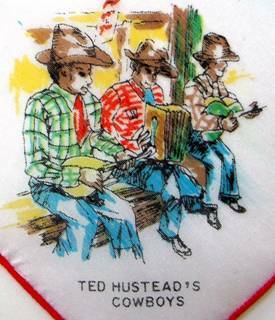 The Chuck Wagon Four and Ted Hustead’s Cowboys serenade and strum to wow the crowd on this souvenir handkerchief from Wall Drug. Here’s some music to enhance your viewing – Dead Across the River by Juan Antonio Toledo Fernandez. It’s a bit downtempo, but easy to listen to while you’re reading. 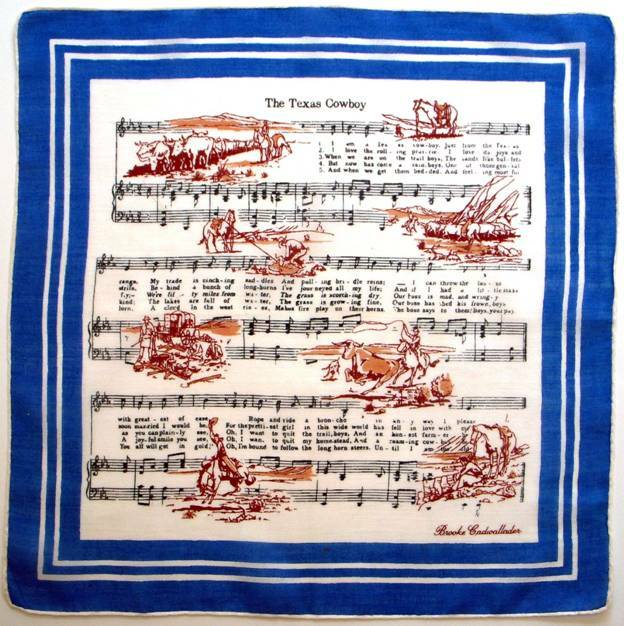 Every hankie tells a story and this one is no exception. You can read a more comprehensive version in Guidepost magazine, but here’s a synopsis. In 1931, Ted and Dorothy Hustead were looking for a place to put down roots in a town with a church they could attend daily. Their search led them to the tiny prairie town of Wall, pop. 326, where they purchased the drugstore, and stretched a blanket across the back section to create a “home.” It was the height of the depression, and they gave themselves five years to make a go of it, but by 1936, with a nine year old and a newborn to feed, business hadn’t improved. One hot summer day, with traffic rumbling on Route 16A so fiercely it shook the house, Dorothy had a brainstorm. They staggered signs along the highway (in Burma Shave fashion) offering Free Ice Water. They were instantly mobbed, and by the following year, had to hire eight girls to serve the customers. 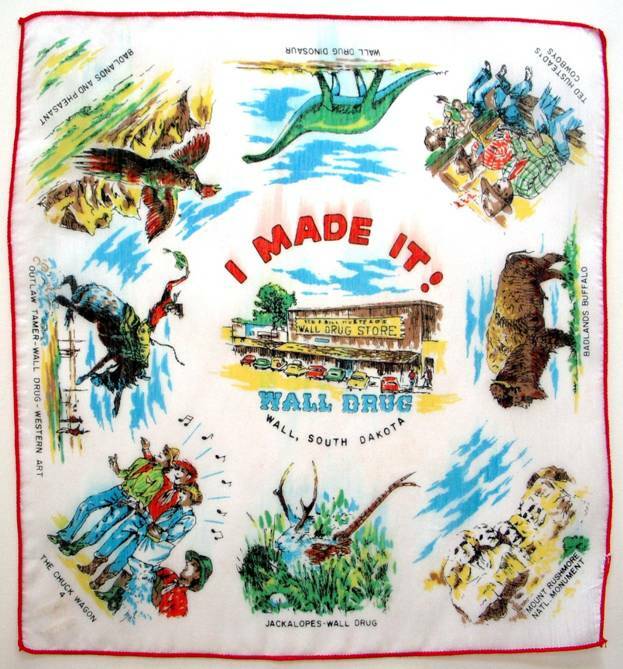 Today Wall Drug serves up to twenty thousand people on a summer day. (You read that correctly.) So much for little ol’ prairie ingenuity. 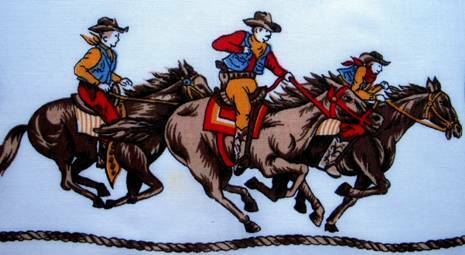 Another landmark that started small and is now an institution is Frontier Days, Cheyenne, Wyoming ‘s famous rodeo, better known as “The Daddy of ‘em All.” First held in 1897, it now draws crowds of 200,000 annually. 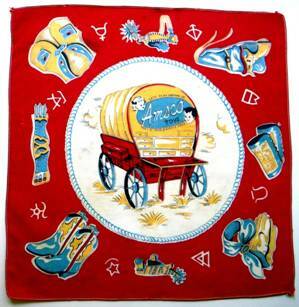 This Cheyenne hankie has it all, from covered wagon caravans to the Union Pacific to bucking broncos. Note the clever use of bow & arrow to indicate due North. 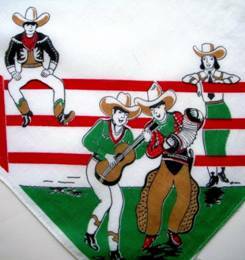 One Denverite told me “When my college buddies and I decided to hit Frontier Days in the early 70’s, we almost missed it. We thought Cheyenne would look like it did in the TV westerns. In reality, it was just a stop on the highway. 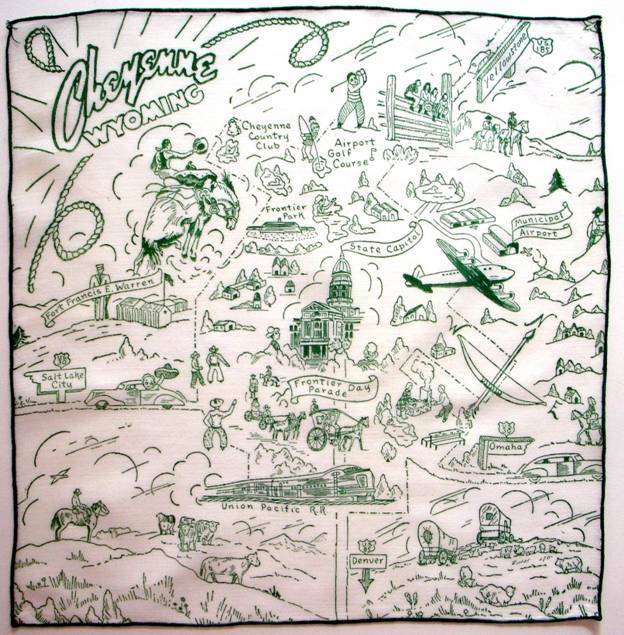 We drove about 8 miles too far before we discovered we had driven right through the town!” This hankie depicts those early days. 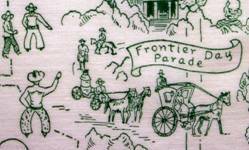 Today, Frontier Days boasts a museum, art show, frontier town, carnival, saloon, Indian Village, chuck wagon cook off, and more. 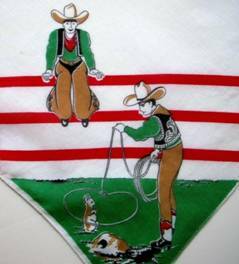 With or without the extra trappings, the rodeo has always been a great show of horsemanship, and will leave you on the edge of your seat. 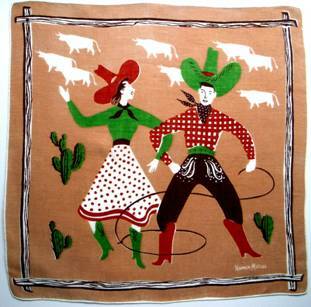 No cowboy would be caught on the prairie without a bandana to shield his face from dust storms. This sophisticated red & gray number is just the ticket to finish any fashionable cowgirl’s outfit. 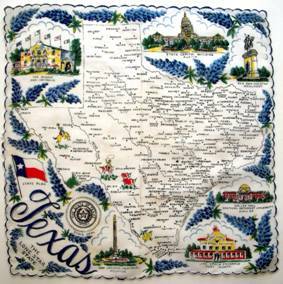 The stars at night, are big and bright, deep in the heart of Texas….. When I was a very little girl, my aunt would take me to the rodeo in Oklahoma to watch my uncle perform rope tricks. First I’d have to approach the band with my aunt’s request to hear “I Love Those Dear Hearts and Gentle People Who Live in My Home Town” (which embarrassed me no end.) Then we’d run to the show ring and watch my Uncle Bruce. His day job was high school principal in Enid, OK. Here, he performs before the student assembly. Only a fool would try and cut class when the principal could lasso you and tie you to your chair! Check out the gargantuan lasso on the right. Years after Bruce passed on, I met one of his students, who told me “He always handled us fair and square. Sometimes we’d play hooky when a new western (what else?) was at the picture show. Bruce knew right where to find us. When the movie was at its most climactic, out of nowhere he’d appear, tap us on the shoulder and say ‘Boys, let’s get back to class.’ He never called our parents. Later, when I was a parent, I knew if I got a call from Bruce, my kid must have done something major. He was our Will Rogers, kind and wise, but implacable in his principles. He led by example, and we wanted to make him proud of us.” Here’s to you Bruce Selby. I’m sure you’d say you were just doing your job, but your influence on your flock spread as wide as your famous lasso. 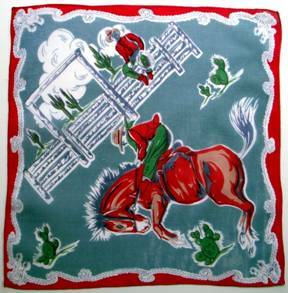 This balladeer textile teeming with cowboy images is a Brooke Cadwallader creation. 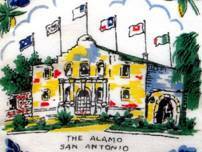 The artist’s life was as peripatetic as any wrangler – born in Manila, educated at Andover, Cadwallader studied art in Paris, and eventually established successful businesses in both Manhattan and Mexico. His very first fabric print was purchased by fashion icon Elsa Schiaparelli, shortly followed by Molyneux and Paquin! 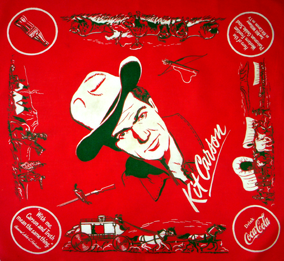 His specialty was silk scarves, which sold for $20 in 1940, the equivalent of $280.00 today. You can view a short BBC clip here. Needless to say I was over the moon to find this hankie. Back in the day, ladies kept handkerchiefs, gloves, and stockings in protective boxes. 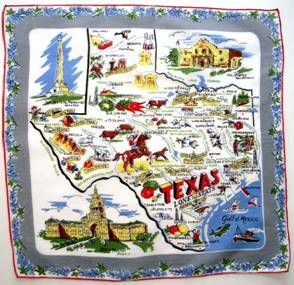 This mini-portmanteau, featuring a Dallas cowgirl, provides the perfect home for a Cadwallader hankie. The brave gal in matching violet hat and shirt accessorized with a fiery red bandana is both fashionable and fearless! 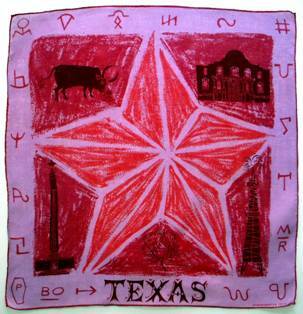 This Neiman Marcus number pays tribute to all things Texan, from longhorn steer, to oil wells to the Alamo. The lavender and red color combo is fashion forward, while the crayon sketchiness, rough as a dust storm, says this is prairie fashion all the way. 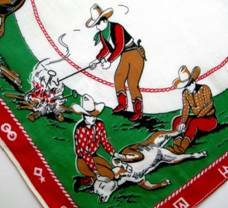 Another Neiman’s hankie finds a cowboy who has lassoed the lass of his choice, but oops, he’s ensnared himself as well! With her hat matching his boots, and his hat matching her boots, we get the message they’re the perfect team. 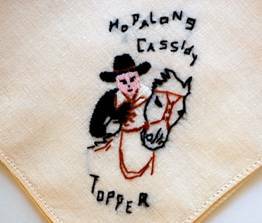 Rodeo cowboys are the “real deal” but much of our image of the All American Cowboy, we garnered from film and television, beginning with Tom Mix “King of the Cowboys” who appeared in over 291 films. Many actors have played cowboys, but Mix was a true cowboy, master horseman and expert shot who did his own stunts on his famous steed Tony. “Baby sister, I was born game and I intend to go out that way”. Light years before Star Wars, Ninja Turtles and other action figures, Hollywood cowboys learned how to merchandize their image to capitalize on their popularity and stardom. William Boyd, who played Hopalong Cassidy in 66 films, took a huge gamble in 1948 and mortgaged everything he had to pay $350,000 for the rights to his films. He edited them into a successful television series, and the rest is history. More than 100 companies manufactured $70 million in Hopalong products, including children’s dinnerware, soap, roller skates, wristwatches and jackknives in the year 1950 alone. 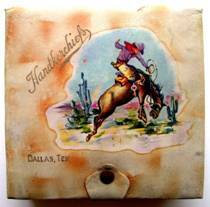 The first lunch box based on a tv show carried the image of Hopalong Cassidy and sold 600,000 units in 1950. Actors may have been greenhorns on the range, but they knew how to lasoo licensing agreements. Another successful TV western which ran 1951-55 starred Bill Williams as Kit Carson, a mountain man, trapper, courier and scout. Hired by General John Fremont to serve as a ‘pathfinder’ through the west, the general affirmed “With me, Carson and truth mean the same thing.” Apparently Carson and Coca-Cola also mean the same thing. Gotta love those sponsors! 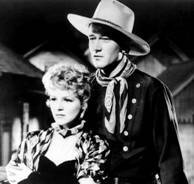 After Hopalong captured the imagination of children, western actors were in great demand. Roy Rogers, already successful on radio for nine years, moved to TV in 1951-57. Rogers had action figures, Dell Comics, and more. Singing cowboy Gene Autrey became famous not only for westerns but for children’s Christmas songs including Frosty the Snowman, Rudolph the Red Nosed Reindeer and Here Comes Santa Claus, where he asks Santa for Tom Mix boots! Autrey recorded over 640 songs, sold more than 100 million records, and had the first gold record. He also built western sets for film makers on his Melody Ranch. Yep, these men employed cowboy ingenuity Hollywood style. I include these sales figures not for financial interest but to underscore and emphasize how significant the image of the American cowboy was to children growing up in the 1950’s – strong, brave, and ready to defend family at all costs. 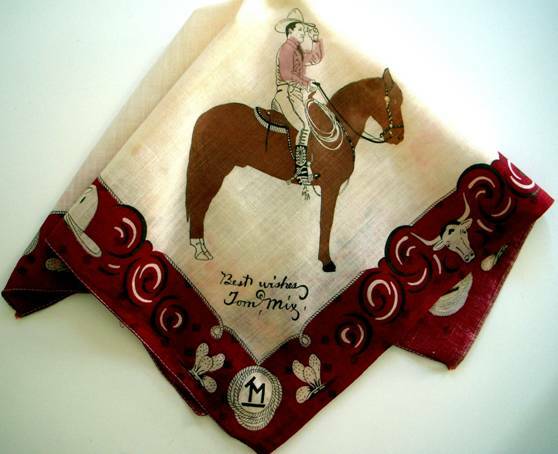 Not surprisingly, we find the cowboy a major motif in children’s handkerchiefs of that era. Note how Amsco toys carousels all things western round and round the chuck wagon. Western wisdom may have been born on the range, but it can apply to the boardroom, the bedroom or the backroom in most situations. If you’re riding ahead of the herd, take a look back every now and then to make sure it’s still there. When you give a personal lesson in meanness to a critter or to a person, don’t be surprised if they learn the lesson. It’s better to be a has-been that a never-was. Live an honorable life. Then when you get older and think back, you’ll enjoy it a second time. Don’t interfere with something that ain’t bothering you none. When in doubt, let your horse do the thinking. You can’t trust your dog to watch your food. A good horse never comes in a bad color. Ride the horse in the direction it’s going. Life is simpler when you plough around the stump. The easiest way to eat crow is while it’s still warm. The colder it gets, the harder it is to swallow. A smile from a good woman is worth more than a dozen handed out by a bartender. Note: there is a huge debate that a true cowboy is not a rodeo rider, but a rancher who tends his cattle through sleet and snow in the dead of night. 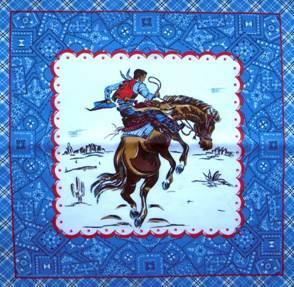 I’m not here to fuel that debate, but to share handkerchief images of the west. Hopefully, you’ll enjoy them all.